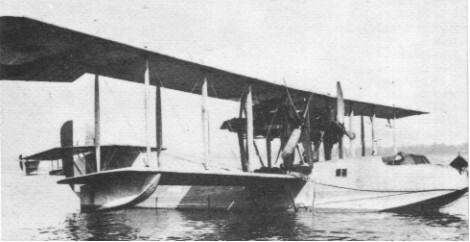 By July 1916 first examples of a larger Curtiss flying boat design began arriving in England. Designated H.8, these were quickly modified to accept more powerful twin 250-hp Rolls-Royce engines, and redesignated Curtiss H.12s, or 'Large Americas'. Although the lightly constructed hull was easily damaged in rough seas, the Large America was extensively used by the R.N.A.S. for anti-submarine, anti-Zeppelin and general recon-naissance duties. Engines: 2 x 345 h.p. Rolls-Royce Eagle. Bomb load: 4 x 230 lb (100 kg).